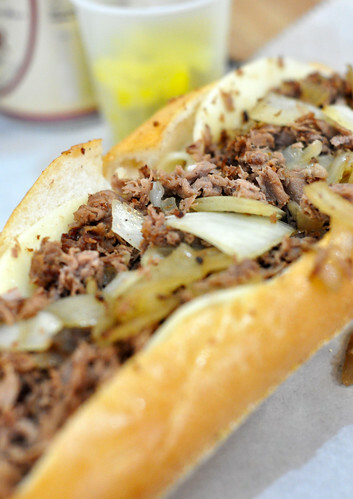 One of the things I HAD to try while I was in Philly was, of course, the Philly Cheesesteak. 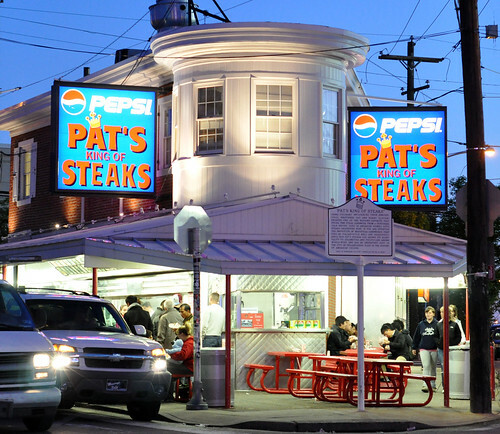 I'm sure most of you have seen on TV at one time or another the great debate over who has the best Philly Cheesesteak: Pat's or Geno's. 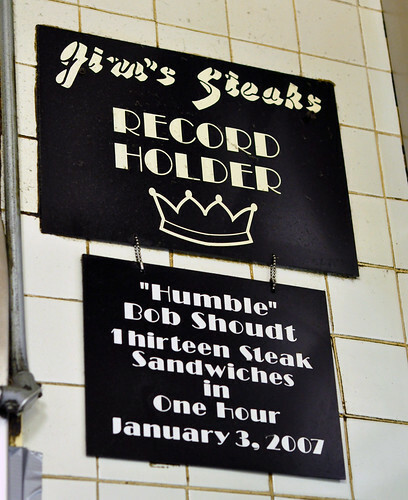 They've featured these two joints playing up the fact that they are directly across from each other and claim to be the originators of the Philly Cheesesteak. My friend and her boyfriend told me that these two places draw a lot of the tourists, probably because of all the exposure on TV, but the REAL place to go was a place called Jim's which was another 10 minute drive. My goal.. try them ALL and see which was really the best. I was in my stretchy pants, ready to go. 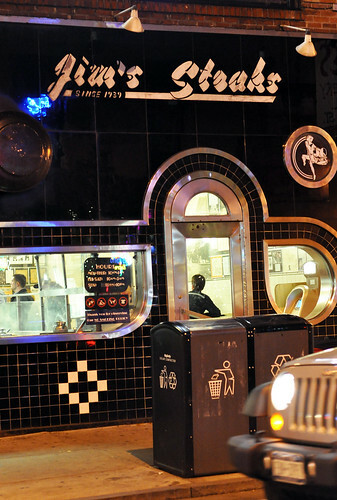 Pat's was definitely less glitzy than Geno's right across the street with their neon lights. 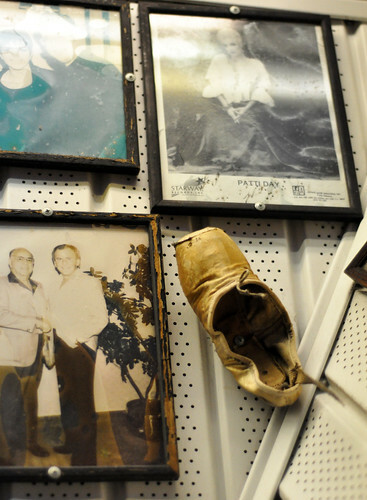 I'm sure there was a story behind this but among all of the photos of celebrities with their autographs was this ballet shoe. Looks like it's been there a long time. 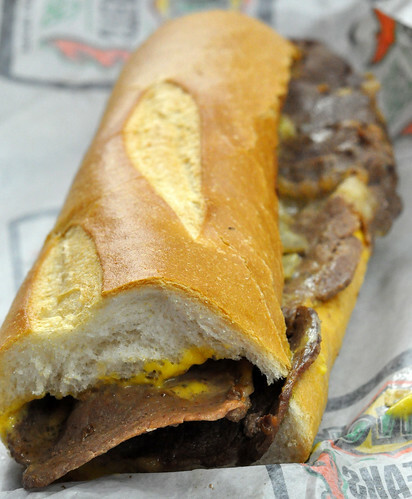 We got the steak "wit" whiz. Jackie had told me that they yell at people if they don't order properly so I got scared and made James, Jackie's boyfriend, order. Yummy. 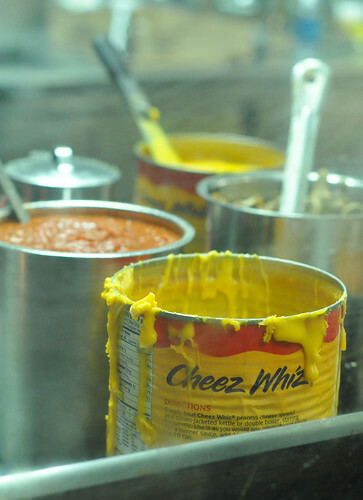 Loved the cheese whiz. The steak had really nice flavor to it too. Same deal. 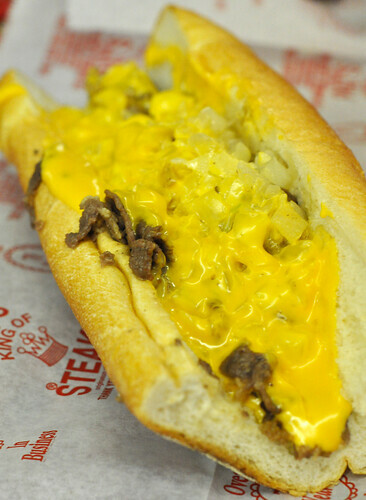 Steak, "wit" whiz. Sorry, I know this doesn't look appetizing but you couldn't see any of the steak or cheese when you open the sandwich so I had to open it up. Immediate difference between Pat's and Geno's, Geno's bread was more like a baguette and Pat's was more soft. 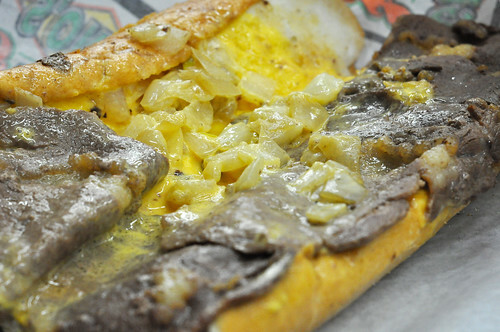 Since I had the cheesesteak twice with whiz I thought it would be a good change to get it with provolone for the last one. It didn't make for an even tasting but I had to add a little variety. We hit up all three places in an hour but to eat 13 sandwiches in an hour?? That's just crazy. Sounds like a job for Man vs Food. After we ordered and got our food we went to the seating area upstairs. Seating was inside.. plus for Jim's. I must say it didn't look quite the same without the whiz.. but the beer was a great addition. 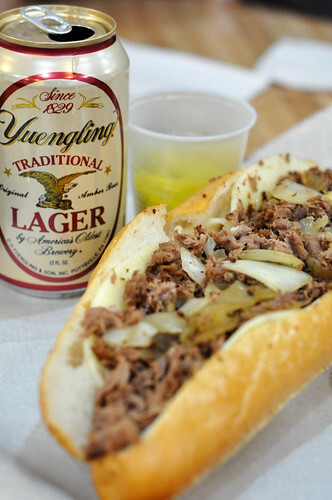 This is Philadelphia's own beer. It tasted really light.. almost like a Korean beer. I'm not much of a beer drinker so I can't tell you if it was really good but it wasn't bad. 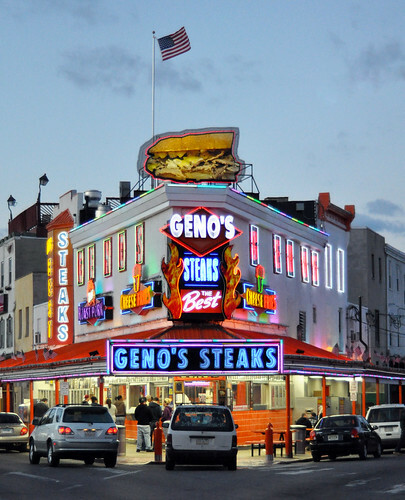 So the winner between Pat's, Geno's, and Jim's? It's gotta go to Jim's. Though Pat's was pretty tasty, there was something about the meat that I liked much better than Pat's. The quiet seating upstairs was also another huge factor. It was warm and cozy inside whereas the other places had seating outside in the cold. Kudos Jim. No wonder the locals love you. 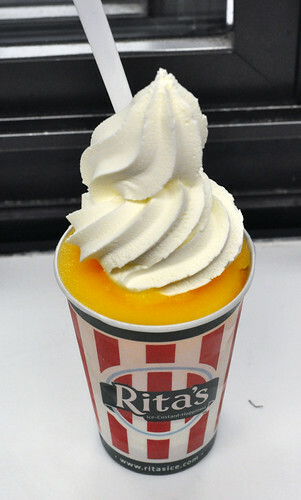 Though I was unbelievably full we decided to stop by Rita's Water Ice. They have frozen custard and what's called, "Water Ice." It's kind of like a slushy. I got the combo with both. It was a mango water ice and vanilla frozen custard. Water ice was yummy but the frozen custard... oh... my... gah... it was soooooo good. 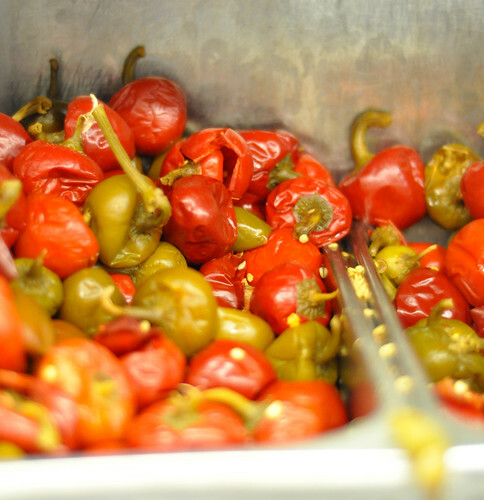 Kind of like McDonald's cone but thicker and more intense flavor. I really wanted to have it one more time before I left but so such luck. Looking back it's funny to have visited so many food joints that were names: Pat's, Geno's, Jim's, and Rita's. I will definitely drop in on my dear friends if I ever go back. Ooooh, I want to try all of these! Nice comparison post! I saw the two philly cheesesteak places on travel channel. 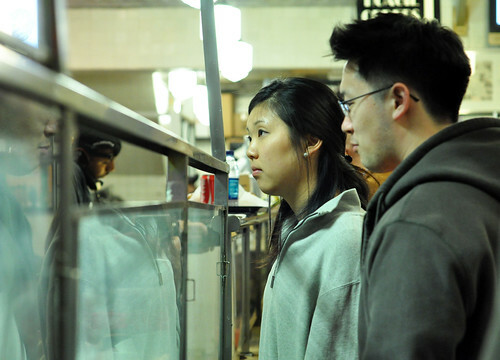 My fiance and I wanted to go to Philadelphia just to try the cheesesteaks! hahaha... I'm so jealous!